600RR.net > Technical Talk > Oil and Lube > 08 CBR oil change walk through. 08 CBR oil change walk through. 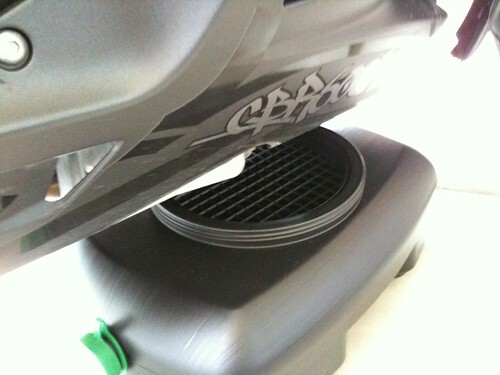 So the side fairing comes off easy enough this gives really easy access to the oil filter. once oil is drained we'll move on to the oil filter. 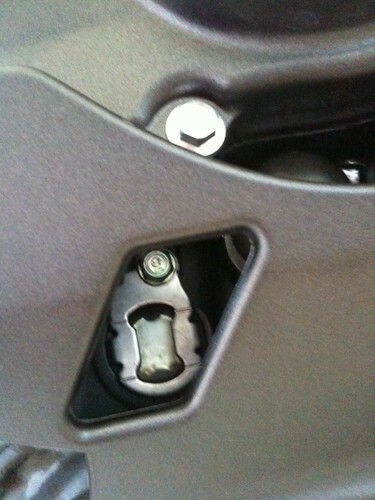 once the oil is drained remember to tighten the drain plug so oil actually stays in the motorcycle! I always just have my oil filters hand tightened so with a little force it should come right off. This is where we want to use the tin foil I just placed the tin foil under the oil filter as I removed it and funneled it down in between the headers. 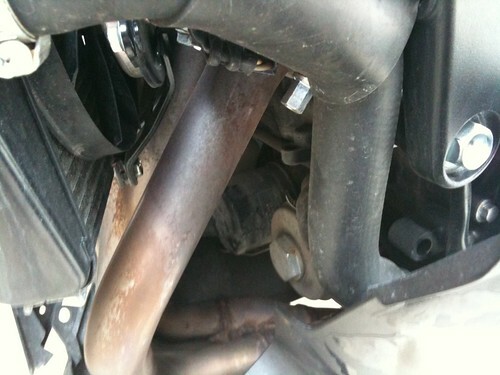 This is optional, if you spill some oil on the headers it will burn of and stink but no use crying over spilled milk. Honda calls for 3.1 quarts of oil, I only ended up using 3 and it filled it just fine. I added about 3 quarts started it up and ran it for about 4 minutes. Remember to check the oil level window. the photo above is with the Bike on the kick stand make sure you level out the bike so you actually see oil in the oil window, If you see oil filled up in the window while the bike is on its kick stand, you officially have to much oil in your Bike. Reinstall side fairing and your done! In total took me about 45 minutes and only cost be about 35 dollars. Well worth it! hope this helps if you have any questions just ask! I hope its ok if a little oil gets on the headers. I changed my oil for the first time today and it was a piece of cake. Thanks for the sticky it was awesome. Honda calls for 3 quarts with the change of the oil filter. But great write up otherwise. 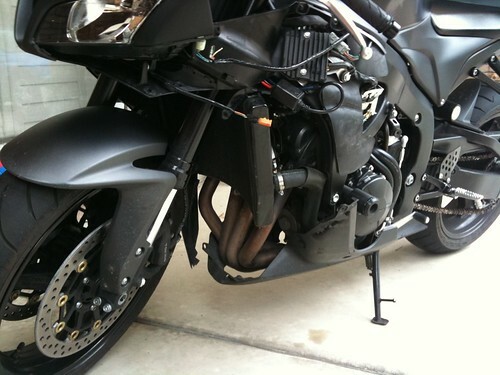 whoa you took your whole fairings off...isnt the bottom one sufficient? 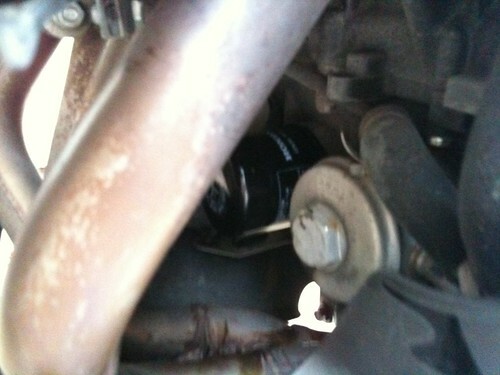 It probably is but I just found this easiest to get to the oil filter off. Truth be told you don't really need to take off any of the fairings. This way just seemed best to minimize oil spilling on the headers. Nice write-up, thanks for posting that. nice walk thru mate, thinking of an oil change wont need to look any further than here for info. Where did you buy the oil, filter, drain container? 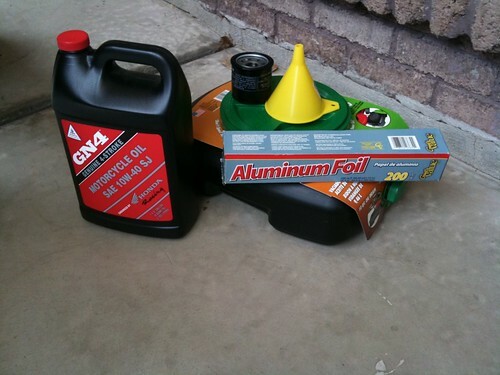 I'm going to do my first ever oil change and I've seen it done once on a car like 5 years ago so I kind of got the idea. I just dunno if I should just go to my local Autozone or do I need to get OEM specific stuff at the dealer? I purchased a pre-owned 2009 Cbr 600rr that had its oil changed right before I purchased it from the dealer (it had 9,500 miles). Rode it for about 4 months and it now has around 11,000 miles and I'm getting it ready for winter storage. too many places to buy oils and filters just make sure what you get is pretty much motorcycle specific. Lot of people here just contact the Amsoil dealer guy here on the forums and order oil and filters through him. Usually arrives at your door within a week of your order or less. Mission acomplished!!!!!!!! !...though I encountered a couple problems, mainly due to me learning how to do it the first time. Got all my supplies at the same place I bought the bike from they are very helpful. Overall I would say this is a 15 minute job but it took me about an hour. After I put the fairings back on (F**k!) I realized I did not have to take off any fairings as I saw that they located everything easy access. I rather clean up a little oil spill on the pipes than having to deal with fairings. Greast Write Up! I'm sure it will help ALOT OF PEOPLE! This is awesome! This will be very helpful since im up for my first oil change. Thanks for the pics. Just finished. Was easy-- really appreciate the post! Also, I've seen a lot of back and forth elsewhere on the forum about whether or not to remove the fairing. After seeing how simple that is, I wonder why it's even an issue. Even for a newb like me! Anyone happen to know what oil filter cup will fit the OE filter? Could you do all these with just the kick stand down on your bike or does it have to be on a special ramp or stand?? Also, did you just use a regular allen wrench to take the fairings off or what kind of tool did you use? Last edited by danieljogbn; 04-16-2011 at 11:34 AM. Great write up man. I especially like the part about the oil window as well, good thing to give that kind of info to non mechanical types. 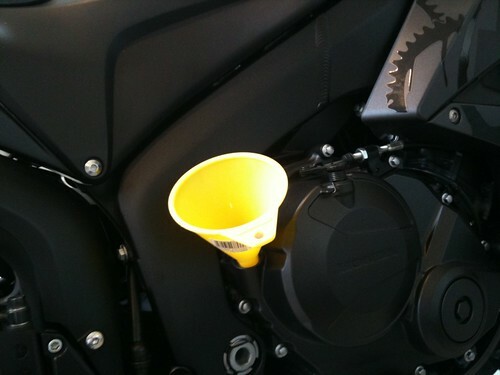 This way they learn, and the fairings idea I think is great. It's always better for more accessibility when doing this stuff. so i changed my oil and i spilled some oil while i was taking the filter out.. when i turned on my bike and let it run for a bit... a few mins in my bike started to smoke up like crazy.. the source was from the pipes that are right under the filter.. will the smoke go away? what can i do to make it go away? You can search around for OIL ABSORBENT WIPES, they soak up oil and are great to have around. I reuse them most of the time. But they will wipe up any spilled oil better then a cloth rag. You're suppose to torque the drain plug on with a new gasket(washer) and even torque the OE filter on. 22 ft lbs for drain plug, 20 ft lbs for oil filter. Get a oil filter wrench that fits on the 3/8" torque wrench so it's easier. Otherwise a hand tightened filter on an o-ring style filter won't be reliable. That only works with oil filters with a thick gasket that is suppose to be turned 3/4's of a turn once the filter touches the baseplate. Oh and if you don't replace the drain plug gasket it will potentially leak. Man raining on my day. 5 Attachment(s) I am a pic WHORE! !